Ordering new supplies for your thermal printer can be such a chore, but not with USDM’s P55 DVD Media kit! Get everything you need to resupply your TEAC P-55 thermal printer in one low cost bundle. It includes 500 TEAC P-55 compatible DVD-R, 1 P-55 photo ribbon set, and a printer cleaning kit. A company only works as well as its machinery, so keep your thermal printers well stocked and in tip top shape! The USDM TEAC P-55 media kits are an easy way to reorder the necessary supplies to run your TEAC P-55 printer. 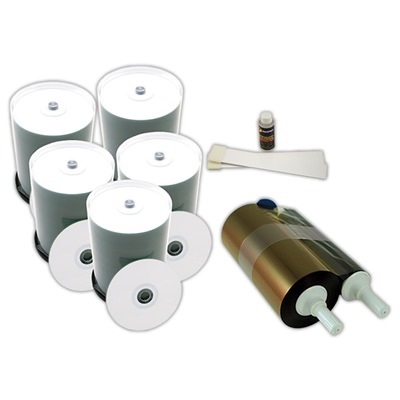 The kit includes special DVD-R media that is designed to yield the best prints possible. The DVDs are high grade for superior recording and storage life. The cleaning kit included allows you to take good care of your investment by keeping the rollers and print head clean and free of residue.